The Scoop: Sarah Jones is the daughter of an engineer and the sister of an engineer, and she has dated many engineers as well. She has seen firsthand the dating challenges faced by reserved and intelligent men, and she has made it her life’s mission to help them come into their own. In 2014, she founded a private coaching business called Introverted Alpha to support highly capable and thoughtful men in the dating scene. Her one-on-one coaching sessions and training modules give these analytical singles a framework for understanding attraction, love, and relationships. Sarah recently incorporated personality assessments in her work to dive deeper into what makes her clients tick and teach them how to become the best possible version of themselves. In 2014, Sarah Jones was at a friend’s house and chatting about a new business idea while he was stirring dinner on the stove. Sarah explained that she wanted to launch a dating coaching business to cater to quiet, intelligent men. She would call it The Attractive Introvert. Professional dating coach Sarah Jones champions the shy single guy in the dating scene. Sarah’s eyes lit up, and she rushed to the nearest laptop to buy the domain right there and then. Her goal as a professional dating coach is to empower men to take the lead in the dating world, and she loves that the name Introverted Alpha reflects that mission. By summer, Sarah was ready to launch her website and become a positive influence in the lives of men who, for one reason or another, hadn’t cracked the dating code yet. She has since worked with engineers, entrepreneurs, and mind-driven guys from all walks of life. Founded in San Francisco, Introverted Alpha has trained IA Dating Coaches who all take pride in serving an elite yet often overlooked segment of the dating population. Under Sarah’s guidance, the team works hard to bring out the best in clients and help them become more genuine and attractive daters. Sarah’s coaching style is grounded in authenticity. For her, dating coaching isn’t about teaching men to be different — it’s about encouraging them to discover their unique worth and bring out their best selves for all to see. Sarah has devoted herself to uplifting the shy guy, and her niche company has flourished thanks to her care, compassion, and insight. Her 12-week, high-touch coaching program walks singles through the ins and outs of dating and turns attraction into a science they can understand and master. Introverted Alpha takes an analytical approach to love and provides in-depth training modules to get clients up to speed. The savvy IA Dating Coaches provide feedback over the phone and via email. They openly assess a man’s body language, grooming, appearance, online profiles, and more to help him become the best possible version of himself. The company’s positive testimonials speak to the coaches’ good judgment and their uncanny ability to get clients on the right track. Introverted Alpha offers personalized coaching to meet the needs of highly educated single men. In addition to her private coaching program, Sarah has developed a new program that will support single men by uncovering their personality and drawing conclusions about their patterns of behavior. Sarah’s program applies a complex personality typing system called the Enneagram test to the dating world and gives her clients a foundation to understand the different ways people think. Sarah makes no secret of the fact that she loves logical, intelligent men. She genuinely feels for the soft-spoken engineer standing off on his own because they remind her of the kind and thoughtful guys she’s known and loved. She has seen the value in the shy guy and knows how wonderfully attractive he can be — and she has been very successful in helping him see that too. Introverted Alpha has positioned itself as a dating resource in the heart of the tech industry. Sarah tailors her coaching techniques and products to a specific audience she knows very well. As a result, over 25% of Introverted Alpha’s clientele are engineers. These linear guys find a receptive audience and empathetic ear in Sarah, and many say they trust her insights into their love lives. 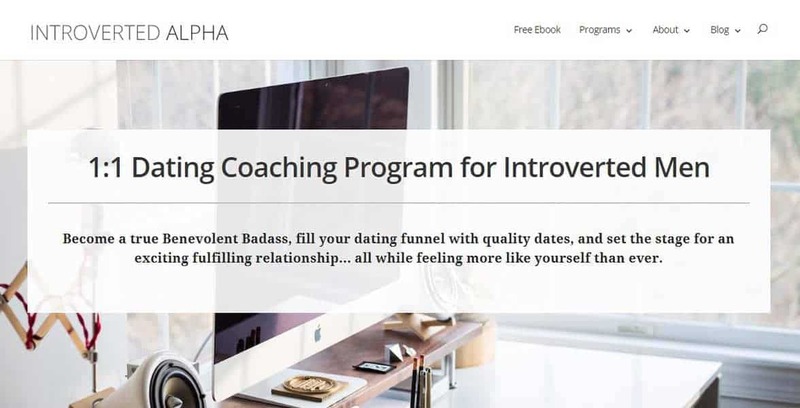 While Introverted Alpha began by serving men in their late 20s or early 30s, the message of the coaching business has attracted singles of all ages. Today, Sarah has seen men as young as 20 and as advanced as 61. Her clients typically tend to be highly successful in their careers but lack the confidence or experience to succeed in building relationships. Some are held back by false beliefs, others by unconscious behaviors, and it’s Sarah’s mission to resolve these issues. Sarah focuses on coaching discerning, rational, and intelligent men, so she has learned to explain dating techniques in a reasoned and respectful way. She makes a conscious effort to listen to her clients’ needs and give them the knowledge they need to feel comfortable and confident in all sorts of dating situations. She has developed robust coaching programs to help the introverted single man chart his own course in the dating world. Launch Your Dating Life and Become A Benevolent Badass offer hands-on resources on becoming more attractive and dating intentionally. These programs couple at-your-own-pace online trainings and personal coaching sessions led by an experienced Introverted Alpha coach. In 2014, Sarah cooked up an idea for a coaching business that speaks to introverted men around the world. She believes in the natural attractiveness of the introverted alpha and she has developed comprehensive coaching programs to bring these smart guys out of their shells and into relationships. Today, Introverted Alpha has made a name for itself by serving singles who excel in their careers but falter in the dating scene. The coaching company has given clients a recipe for success by delivering an empowering message to a niche audience. By emphasizing authenticity and assertiveness, Sarah has helped shy singles flip the script and become more attractive and confident daters.